The Nats are back home and in one of America's biggest soccer cities. Panama... we hope you're ready for this. With three, dramatic points in the bag from their Jamaican vacation the USMNT will have to avoid overconfidence against this weakened opponent (FC Dallas man Blas Perez is out with gastroenteritis) and playing in front of, arguably, one of the largest pro-U.S. crowds they've ever had. A win tonight makes the tougher, revenge match against Honduras in Sandy, Utah look less daunting. Bottom line: do work, get a result. For today's game day beer recommendation we're going to play a little six degrees of separation. Although this one doesn't involve bacon; Kevin or Rogue's Voodoo Maple. Long time readers of this piece (wait... what? I've only been doing for about six months) knows that FBM is a big history nerd so let's dive in. In the early 1900s the United States and President Theodore Roosevelt "assisted" in the Panamanian Revolution that would see the isthmus win their independence from Colombia in 1903. Lo and behold, the next year the U.S. was given the rights to build a canal through Panama, and it was completed in 1914. The United States would control the canal until 1999. Teddy also was found of the suds, once, allegedly, bringing 500 gallons of beer on an African expedition in 1909. Theodore Roosevelt was cousins with another U.S. president, Franklin D. Roosevelt the 32nd to hold the office. FDR, during the Great Depression and World War Two was found of giving "Fireside Chats" to reassure a nation nervous with economic troubles and the global conflict. "Fireside Chat" is the name of an awesome "winter warmer" by 21st Amendment. 21st Amendment is an awesome San Francisco brewery and some other similarly named patriotic brews. 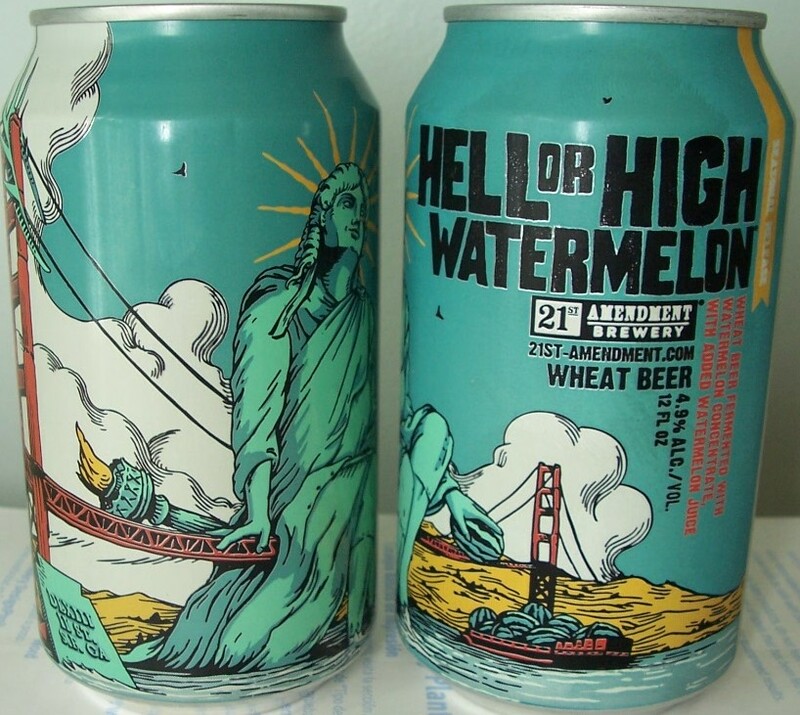 Today, enjoy 21st Amendment's "Hell or High Watermelon" wheat beer. Their webpage introduces the beer as such: "Like Lady Liberty, we stand for independence and perseverance. In the pursuit of innovative beer, there is no obstacle too great." Sounds a lot like our USMNT. Let's do this boys... for Lady Liberty. Friday's night wina against Jamaica wasn't just a massive step toward the United States men's national team's qualification for the World Cup. It was also a massive step forward for us at the Free Beer Movement. In partnership with the U.S. soccer supporters group, the American Outlaws, we hosted the "National Beer Outreach Day". In more than 55 AO chapter bars, all across America, the FBM philosophy was in full-effect. Huge paid tabs, two-for-one deals, steep drink discounts, and, of course, straight-up free beer was flowing like....errrr.... wine... for these supporters of the USMNT. The goal, as always, is to use the power of a free beer to lure newbies to the sport, and in this case, help build support for not only the Nats, but the American Outlaws organization. Already the national team's largest supporters group NBOD was also a membership drive for AO as current members brought unaffliated fans or newbies to get them to join in the excitment of the journey to Brazil in 2014. That sounds like some gondola singer's line in Venice, but it's appropriate for what's on the line for the United States men's national team in Kingston, Jamaica. For Jamaica it's win or their World Cup qualifying odyssey is in "beyond serious" trouble. For the Nats the need to play for the "W" while keeping a close eye on not blowing the draw. Dropping points at "The Office" like during the last round is not an option. It's no nail in the qualifying coffin, but it a blow to the momentum-generating win against Germany last Sunday and what we need to get in gear for home matches against Panama and Honduras in the next two weeks. Without wasting your time let's get right to today's beer of the match. Meet Sierra Nevada "Torpedo" Extra India Pale Ale. The Chico, California brewery is one of the "greats" and "originals". Their pioneering work on the hoppy side of beers has made their brand a staple even at bars that are allergic to craft beer. If you can't get "Torpedo" fill up your pint with the less, hoppy, flagship "Pale Ale". Draft, bottles, or even in a can Sierra Nevada's got you covered. We chose "Torpedo" because we're hoping that tonight's match is the one that sinks Jamaica's World Cup hopes. The worse off the Reggae Boyz sit in the table the more distance we can put between us and them and securing our own qualification to Brazil. Who's the lead Torpedo in the USMNT arsenal? It's none other than captain, my captain Clint Dempsey. He'd got the biggest balls of them all and he's putting them out there to secure passage to Brazil. Jozy is in tube two getting ready to follow up his banner performance against Germany. Bottom line? Jamaica's got a mountain to climb in this match (the Sierra Nevada mountains?) and a loss for them means they're basically done-zo. The U.S. needs to come out torpedoes a-blazin' and get the job done in Kingston. Their backline, set-piece defending, and attack need that "extra" something tonight or otherwise USMNT fans will be looking "pale". What are you drinking for tonight's U.S. game? One of the pleasures of international soccer and, subsequently beer writing, is that you get to explore the brews of your opponent in preparation for the Shakespearean prose you’ll have to scribe later. In the case of this last week’s United States men’s national team friendlies coach Jurgen Klinsmann couldn’t picked better opposition. On the soccer side of things, for American fans, last Wednesday’s match was a doozy and today’s match against Germany might be equally so, but on the beer fan side we’re talking about two of Europe’s boozy best. Soccer equals doozy. Sad face. Beer is equals boozy. Happy face. Today’s match is the perfect example of where we’re at as both a soccer nation and a brewing nation. This USMNT squad is led by a German coach with deep American roots and features a number of German-Americans (“Germericans” as Shawn Francis of “The Offside Rules” puts it) as the Nats struggle to find their identity as soccer team in the shadow of a world footballing power from the European continent. These Germans have left greener pastures to forge a new international career playing (or coaching) for the United States. The verdict is still out, but the future looks bright. Whereas, in the brewing world, American craft brewers are more than holding their own in the face of hundreds of years of German brewing pedigree. In fact U.S. breweries are now successfully invading Germany and giving the land of the pilsner, bock, and Oktoberfest a run for their money as Germans and other Europeans demand to be liberated by hoppier and more innovative beers or just be challenged on their own turf as American craft brewers take on traditional German styles (Don’t get me wrong Germany still does “traditional” the best). Invasion. Liberation. Tell me if you’ve heard this one before? But you all didn’t come here for a history lesson (or did you?…. I do teach for a living). You came here for a beer lesson. You can have both, though. This match is the Centennial match celebrating 100 years of the United States Soccer Federation. A time to celebrate how far we’ve come as a soccer nation and look forward to what we still have to (and will) accomplish as a soccer nation. A nod to old traditions while establishing new ones. What are you all drinking with your USMNT soccer today? So, our Yanks host the Belgians tomorrow. It’s a friendly. It’s a Wednesday. These are three really superb reasons to drink. International soccer friendlies are unique in the world of sport. No other game has anything like them. They are not glorified practices. They are not scrimmages. True, they count for much less than qualification or tournaments. And they give coaches a chance to test out lineups and tactics for more important games. But the whole point is that they get to do it—and we get to watch—in a real game environment. Or, real-ish. FIFA counts them toward its rankings, which are senseless, but that is not the same as meaningless. Even so, it’s a friendly. A jovial word. It serves mutual interests of gearing up for more serious matches. But it sounds like a party. Hey fellas, mes amis/mijn vrienden, my folks are out of town, want to come over for a friendly? If this were a World Cup match, counting for everything, I would say this: Drink American. Find the most distinctive, aromatic, citrus-hoppy session beer you can find and drink it all day, to fan the flames of mojo and karma, bowing in the direction of the Statue of Liberty. But it’s not. It’s a friendly. It’s a collaborative thing. So don’t drink American. Drink Belgo-American. Here is my lineup. I bring it strong. I ask only that Jürgen Klinsmann do the same, from now until October 15. La Rulles Estivale. Gregory Verhelst of Brasserie La Rulles brews ales as Wallonian as they come, with one difference: He uses American hops. Why? Because he likes them best. The 75 cl bottles and panache say Belgium; the lemony-grapefruity flavor and aroma scream Pacific Northwest. Go for the Triple (8.4% abv) if you want something stronger, but my best advice is to buy two or more bottles of Estivale (5.2%). Share them with someone new to the game, or with nobody at all. Senne Schieven IPA. The brewers at Brasserie de la Senne in Brussels are skilled masters in the use of hops, but typically they go for spicier, more subtle European varieties. With this beer they went West Coast, teaming up with Lost Abbey and Pizza Port in California for an American fruit-hop bomb done with Belgian class. Market Garden Urban Garden Saison or Wahoo Wit. Hey, are you in Cleveland for the game? I’d like to think you are. If so, here is an option. I’ve never been but I hear really nice things about Market Garden. And there are a couple of Belgian-style beers on tap right this very minute. Here I wanted to plug in something from Great Lakes, an undersung Cleveland craft brewery making quiet excellence since the Reagan years. It’s tough to find a more impressive pale ale than Burning River, for example, but who talks about it? Well, I would. Except that it would mess with this whole Belgo-American theme I have going here. Nothing Belgian-ish on tap there at the moment. I checked. Just for you. So, Market Garden it is. And there are mussels on the menu, Americanized with spicy sausage, cilantro and chili powder. Find them on the menu somewhere between the gravy-frites and beef-cheek sliders. Those beers may not be easy to find, especially on short notice. Here are some others that might serve: Chouffe Houblon Dobbelen IPA Tripel. Duvel Tripel Hop. New Belgium Belgo IPA. Boulevard Tank 7. Come to think of it: In a pinch, take anything from New Belgium in Fort Collins or Boulevard in Kansas City, two American companies with Belgian-born brewers at the helm. In fact there are sorts of ideas and inspirations flowing back and forth between the American and Belgian brewing worlds these days. Maybe we can learn something from each other on the field as well. Another reason to drink, for those who need such things. Here is another: mayonnaise on fries. Also: Wednesday. I hear there’s another friendly on Sunday. Against who? Anybody know if they like beer? Joe Stange is a freelance journalist, frequent contributor to DRAFT Magazine, and co-author (with Tim Webb) of the upcoming Good Beer Guide Belgium, 7th edition. Follow him @Thirsty_Pilgrim if you’re, you know, into that sort of thing. South Africa 2010. No matter where you were in the world, when American soccer fans saw Landon Donovan's strike hit the back of the net, beer went errrrrvrywhere. The pubs erupted with World Cup joy. Lucky for us we don't have to wait four years for an equalizing moment. Major League Soccer is jam-packed with amazing strikes, goals, headers, and golazos. Every week there are goals that make you leap out of your seat. Since great goals often come from the most unlikely of places you're often not prepared when that beer of yours goes tumbling over in that moment of goal-scoring ecstasy. In the spirit of these unforgettable moments, we at the Free Beer Movement offer you a fitting pairing to replace that spilt pint. Each week we bring you a carefully selected beer to go perfectly with the best scoring moments MLS has to offer. Enjoy responsibly. In one of the least shocking results so far this season, Thierry Henry wins the 2013 Goal of the Week Award for week #11 with his planted bicycle kick against the Montreal Impact. Purists may call this one an overhead kick since he wasn’t completely airborne before contact with the ball, but it looked like a bicycle and it’s been called a bicycle. Regardless of labels, Henry makes television magic with yet another fantastic finish in MLS. There isn’t much to say about this goal in text. New York’s Juninho serves up a corner kick which bounces off the head of Markus Holgersson to arrive at Henry. Titi does not disappoint with the final move to score for NY1. In memory of your dearly departed drink, we here at the Free Beer Movement suggest you replenish your Spilt Pint with a can of "Shift" Pale Lager from the New Belgium Brewing Company (Fort Collins, Colorado). This brewery has a bicycle in its logo and is well known for its flagship Fat Tire beer, also represented by a bicycle on the label. It doesn’t get much more obvious than this. Shift is the beer of choice because (aside from the bicycle imagery) we are teetering on the edge of summer, and we will need plenty of portable brews to take out into the wild blue yonder. Just as NYRB and Thierry prepare for a winning spell through the summer, Shift will lift you into the sunshine with its accessibility and lightness. This isn’t your daddy’s pale lager, however. Shift comes in on a solid 29 IBUs; utilizing four types of American hops to balance this beverage for your enjoyment. New Belgium is distributed widely across the country. Visit their beer finder tool if you have trouble finding it near you. Get out in the sunshine, grab a beer, and have a great summer! Cheers! It's not surprising that some of the world's greatest fans of beer are, of course, going to be fans of the Free Beer Movement. On our old site the evidence of the Germany-FBM alliance was overwhelming and we continue gathering more and more stories of "FBM in Action" in Deutchland. Today it comes from German fans road-tripping to London for the Champions League Final between two German sides, Bayern Munich and Borussia Dortmund. As expected these fans have their priorities straight packing the luggage compartment of their tour bus with beer and not, well, luggage. That's how you spread the free beer love and soccer for sure. Quite a turn-a-round for Bayern who we featured in 2009 as "FBM in Action" when they gave away 7,000 liters of beer to fans as an apology for their worst start to the club season in 43 years. The Champiooooooooooooooooooooooooooooooooooooooooons! That’s right, this Saturday brings the final of the Champions League, with Bayern Munich and Borussia Dortmund meeting at Wembley to decide who lifts the trophy. But considering you’ve landed on a soccer site, you almost certainly knew that already. In fact, you most likely already know all you need to know about the Champions League final. In case you don’t, here’s a quick summary: Dortmund are the mighty underdogs. They’ve been called “hipster” so many times that they’ve gone mainstream, with hipsters now seeking to replace them with another side boasting amazing support and brightly colored kits. Bayern, meanwhile, ran away with the Bundesliga. They took 91 points from a possible 102, losing just once (!) to Bayer Leverkusen back in October. Bayern scored 98 goals in the league while allowing just 18 past. This is, to put it mildly, an incredible side. But, again, you know this. You come to Free Beer Movement for something even more important than soccer knowledge: to learn exactly which beers to drink while watching the game. So let’s delay no further. One of Bayern’s primary sponsors is Paulaner, one of the six breweries that supplies beer for Oktoberfest. Now, clearly it is not the time of year during which one can usually find Oktoberfest beers, but if you’re trying to raise a glass to FCB, you need to at least make an effort. The Paulaner Oktoberfest Bier is available in bottles and cans, so you might be able to find some at your local German bar. If not, go ahead and look for the Paulaner Original Münchner Hell, a classic Munich beer. This lager is a bit lighter than the Oktoberfest (4.9% ABV as opposed to 6% ABV), but you might want a session beer for this match, particularly if you’re getting to the bar early to grab a seat. This Paulaner is technically classified as a “Munich Helles Lager,” which is simply a sub-category of a pale lager. These beers are similar to a traditional Czech Pils, with spicy hops, although they have a bit more malts than a pilsner. The Paulaner stays true to the style, with more biscuit and vanilla than hops in the aroma, with the same coming out in the taste. It’s got a subtle, dry hop finish and is perfect as a session beer. Dortmund, as far as I can tell, does not have a beer manufacturer as one of their sponsors (but one of their first kit sponsors was a cigarette manufacturer, so if that’s your thing…). Like BVB, their homeland, North-Rhine-Westphalia, comes in second to Bavaria when it comes to contributions to Germany’s beer production and styles. But also like BVB, that doesn’t mean there’s not hope of finding something fantastic, of unearthing a diamond overshadowed by its shinier Southern counterparts. Of course, one of the most common styles of the region is a Kölsch‎, most popular further south, in Cologne. Dortmund actually has its own beer style, known as “Dortmunder”, but it’s almost impossible to find in the U.S. It is, however, fairly similar to a Pils. Veltins, which makes a great pilsner, also comes from the area, but we can’t have you drinking the beer that sponsors Schalke’s stadium, now, can we? With that in mind, let’s hoist an Altbier in honor of BVB. Sure, the stuff is primarily brewed in Düsseldorf, but we don’t want yet another Pils – we must stand out from the Bayern fans. Altbiers are more or less the equivalent of an English Ale and the best do a great job of balancing sweet malts with spicy hops. It’s not very common to find a German altbier on tap, unless you’re in a German-style pub, but you’re in luck: Widmer, Victory and Two Brothers all produce decent versions of the style. 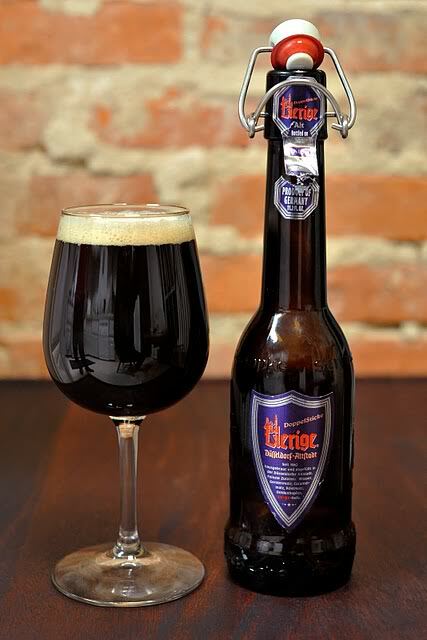 But if you can manage to find Uerige Doppel Sticke, grab it – it’s possibly more like a barley wine, with lots of caramel malts, but it’s a great brew and weighs in at 8.5% ABV. How can you be neutral during one of the biggest matches of the soccer season? Bite the bullet and choose a side. If need be, try both the recommended beers and then make your decision. But if anyone asks why you support one of the sides, be sure to say you’ve been a fan since you were wrapped in [B____]’s kit after the doctor pulled you from your mother’s womb. I may be a law student at Lewis and Clark, but soccer is my true love, with beer coming in a distant second. That's not to say I don't love beer--I've tasted over a thousand different brews, am a bit obsessed with my "33 Beers" notebooks, and love my Untappd app. Living in Portland, Oregon, I attend quite a few festivals and tastings, and am able to argue passionately about the merits of Cascade hops vs. Chinook. As for the soccer, I'm the cofounder of SB Nation's Aston Villa site, 7500 to Holte, as well as the editor of SB Nation Italy. Want more? Follow me on Twitter! Major League Soccer fans awarded Real Salt Lake's Luis Gil the 2013 Goal of the Week Award for week #10. The RSL midfielder headed home his second goal of the year; this time against the Vancouver Whitecaps. In this goal sequence the ball only touches three RSL players start to finish. It begins on the home endline with GK Nick Rimando blasting a goal kck forward across the pitch. As the whole RSL offense bombs forward, Joao Plata catches the ball as it slows outside the Whitecaps’ 18 yard box. He sends in the cross to a fleet-footed Luis Gil who is crashing the box like a bull in a china shop. Gil heads the ball into the net with his last bit of energy before rolling to the ground from a collision with Joe Cannon. This teenager is stacked to the gills with talent. In his honor (and your soggy socks) we at the Free Beer Movement recommend you replace your "Spilt Pint" with a Ballast Point brew. Ballast Point Brewing Co (San Diego, CA) originates from Southern California, much like our young, goal-scoring prodigy. All of their beverages are fantastic, but the "Wahoo" Wheat Beer is the recommendation this week. Summer is quickly approaching, so it is time to start transitioning your taste buds to the refreshing flavors of hefeweizens (as well as other summery beer categories). We like “Wahoo” because it succinctly summarizes the end to end sprinting motion of Gil’s bombing header and subsequent spiral to the turf. Ballast Point is available across the country at better beer stores and bars. Pick one up today. Until the next one… cheers to good beer and good goals! D.C. United, in collaboration with DC Brau Brewing Company announced that DC Brau will brew a limited edition D.C. United specific beer. While the beer is currently without a name, D.C. United fans have the opportunity to name the new brew. Fans can submit their suggestions at "Brand the Brew" on the United website. The special DC Brau craft beer, a golden ale, is crafted specifically for D.C. United and its fans to enjoy. One thousand gallons of the beer will be produced and will be made available exclusively at participating D.C. United official bar partners and at the DC Brau Brewing Company. The D.C. United “Brand the Brew” contest launched yesterday, and will run until May 29. The final list of fan suggestions will be given to a panel of D.C. United players to choose the winning name to appear on beer. The winner will receive a field-side D.C. United gameday experience for two and bragging rights for naming the new D.C. United and DC Brau beer. The brew is planned to become available for order on June 11. At the Free Beer Movement we aren't content with just helping "build American soccer one beer at a time". We're also focused on doing more with our organization. That means using the power of suds for social change. On Wednesday, May 29th we're hosting "Good Brews, Social Change" (link to RSVP on Facebook) in FBM HQ's Austin, Texas at Hops and Grain Craft Brewery. Hops and Grain is one of Austin's best breweries and they've got a World Beer Cup Gold Medal to prove it (for their flagship "Alt-eration" a German alt beer). "Good Brews, Social Change" is being held to benefit the Homeless World Cup, a global organization that serves over 250,000 players in over 70 countries. The founder of the Homeless World Cup, Mel Young, is in Austin to be the keynote speaker at the North American Society for Sport Management and before that speech we're hosting him at Hops and Grain for a meet-and-greet. From 5pm to 9pm a $20 donation will get you in the door, a Hops and Grain pint glass (for you to keep), and five pours of any of their great beers on tap. Plus you get to mingle with us.... and Mel, too. And don't worry we'll have the U.S. men's game versus Belgium on somewhere, too. If you can't make the event, but would still like to help the Homeless World Cup and support their mission please make a donation through their website. We hope you'll join us for our first philianthropic effort (minus all the soccer and beer Kickstarter projects we've funded!) and use the power of beer and soccer for even more good. It’s not the Champions League final. It’s not even the most exciting match on tap this week. Yet the Europa League final means midweek soccer and the chance to drink beers in the afternoon, so there’s no reason to miss Wednesday’s game. Besides, there’s something strangely compelling about the match between Chelsea and Benfica. First of all, it’s not every year that last season’s Champions League winners crash out of the group stages and wind up in the Europa League final. Most managers would’ve crawled into a corner to lick their injured pride, but Rafa Benitez outfitted Fernando Torres in a Zorro mask and went charging through Thursday nights. Something about his superhero costume perked Zorres right up, and the Blues cruised through courtesy of his goals – although, it must be said, Chelsea was quite generous about allowing their opponents back into every match. Then there’s Benfica, who haven’t lifted a European trophy in 51 years. They last won the European Cup in 1962, with Bela Guttmann at the helm. But after beating Real Madrid, the Hungarian demanded a pay raise. When Benfica refused, Guttmann left, but not before cursing the club, claiming they’d never boast of European glory again. Interestingly enough, Benfica have made it to a European final six times since Guttmann’s pronouncement – will this seventh time finally see them break the curse? Of course, we all know what’s most important about the Europa League final: the beer you choose to sip while watching. With the match taking place in Amsterdam, you might be tempted to grab a Heineken. Resist this urge. There’s really nothing that sets Heineken apart from Budweiser or Coors, except that it comes in a prettier bottle. You can do better. For the best Dutch beer, you’ll need to find La Trappe, which has almost certainly been written about on this site before – but it’s pretty close to perfection, so I make no apologies. La Trappe used to be called Koningshoeven in the U.S., but the brewery realized absolutely no one outside of Holland could pronounce the beer, and made the smart decision to use La Trappe. Koningshoeven actually brews eight beers (try Isid’or if you get the chance) but usually the only one you can find in the States is the quadrupel. 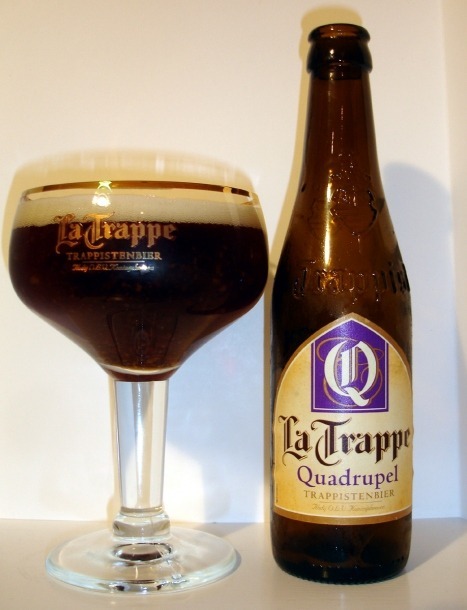 Prior to sitting down to write this column, I had no idea that the “quad” style was modeled on the La Trappe Quad. It’s the prototype, and while other brewers can gussy theirs up with added fruits or oaked barrels, they’ve yet to make a simple quadrupel as flawless as this one. Be sure you pour it into your Trappist glass – come on, we’re all beer snobs here, and you know you’ve got one – and don’t be worried when there’s little or no head. Instead, take a big whiff. Mmmm…caramel apples. Sure, you can fancy up that description with “Belgian yeast” or “spiced dark fruits,” but really, it’s caramel apples. Now, time to taste. Despite a 10% ABV, the alcohol in this quad isn’t at all overwhelming. The taste has some of that caramel you’ve been smelling, along with raisins and plums. It’s not too sweet though, ending on a slightly bitter note and leaving a bit of an alcohol burn behind. Canadian dude extraordinaire Jonathan Osorio rides away with the 2013 "Goal of the Week" award for week nine. Osorio, born in Toronto, Ontario, is plying away his debut in the league with his hometown club, Toronto FC. This is his second goal of the season. The play originated with a free kick in the attacking half against the New York Red Bulls. The ball was played in to the mixer from distance, and Luis Robles whiffed the punch clearance. The ball fell to a red foot and was instantly passed out of the box to an eager Osorio. The rookie side stepped an on-rushing NYRB defender to give him a tiny bit of breathing room to let loose a precision strike to thread the gap between (a slightly recovered) Robles and the crossbar. In honor of this goal and your floor-beer now seeping into the carpet, we here at the Free Beer Movement recommend you replace your spilt pint with the best of the best Canadian flavors. Founders Brewing Company’s “Canadian Breakfast Stout” (Grand Rapids, Michigan), or CBS for short. This brew has topped the international tasting charts with some of the highest ratings found on the interwebs. It drips of maple and bourbon, having been aged in each before being put out to the masses. If you are lucky enough to snag a bottle, savor it as you would Osorio’s wondrous effort. Cheers! D.C. United is embracing the Free Beer Movement in their latest gameday promotion! For just $44 you can get two tickets and two FREE BEERS for next Wednesday's (May 8th, 7pm ET) match against the two-time defending Eastern Conference champion Houston Dynamo. That's a great deal, and in the spirit of the FBM philosophy. Even better, though? We're giving away two of the FBM-esque packages for Wednesday's game. Yup, that's FREE BEER and FREE TICKETS for you and a friend! Why not make it an epic FBM night and bring a newbie and show 'em what American soccer is all about? "Hey @FreeBeerMovemnt... I want free tickets and free beer from @DCUnited! #FBMDC"
Want a second chance to enter? Like us on Facebook and comment on the D.C. United ticket post. A great contest, great American soccer, and a chance to practice the Free Beer Movement in action! Javier Morales nets a rare headed goal for this eighth edition of the 2013 Major League Soccer "Goal of the Week" Award. The play starts on a failed counter attack from Chivas USA. Morales takes off with the give-away when Eric Avila slips at the centerline. Three short passes sets the ball at the feet of Álvaro Saborío who sends in the cross. Morales, who never stops running during this play, loses his mark at that exact moment to head the ball past Dan Kennedy for the eventual game-winner and lone goal of the match. This is only the Real Salt Lake midfielder’s third headed goal in his career. In his honor, we at the Free Beer Movement recommend you replace your spilt pint with a superior beverage from local Salt Lake City outfit: Epic Brewing. The beer of choice comes from Epic’s “Elevated Series” of brews because no regular everyday drink is worthy of Morales’ constant effort for RSL. The Argentine has been a near constant presence for the team, creating positive impact every season since joining MLS in 2007. We’re having a bit of fun this week suggesting that the “Brainless" Belgian-Style Golden Ale represents Javier’s latest award in a whimsical way. This is a pairing that is ironic in the sense that Javier is an incredibly intelligent athlete with some of the best vision and positioning awareness in the league. However, the distinction is literal since he almost never scores a headed goal (his physical brain-cage) theretofore… an oft brainless striker. You can find Epic beers in 12 states plus the District of Columbia. Check out their beer directory to see if it is available near you. In the world of modern football, certain matches are labeled “derbies” and played with as much – often even more – venom as those that involve cross-town rivals. There are different types of these fake derbies. Some take the form of a regional rivalry, such as the Revierderby between Schalke and Dortmund, or the Derby du Rhône, between ASSE and Lyon. Then there are the derbies between clubs that traditionally lead the league, including the Derby della Italia featuring Juventus and Inter Milan, or everyone’s favorite match, when Barcelona and Real Madrid play out El Clasico. But even in the post-globalization era, in which we’re all watching the same match at the same time and making the same pithy comments on Twitter, there’s something more compelling about an intra-city derby. Sure, you can mock your friends long-distance when, for example, LA Galaxy and DC United meet. It’s likely that Manchester United and Chelsea supporters wind up working in the same office, even outside of England. Yet spending a weekend treating your neighbor, who came over just yesterday to share a six-pack, like he’s your greatest enemy…well, that’s the magic of a real derby. This weekend brings a couple good derby matches. The first, on Saturday, is El Derbi Madrileño. Atlético Madrid are just three points back of rivals Real. Sure, it doesn’t really matter which side gets second and which gets third, but the point here is pride, people. And if Atlético get those three points in a derby, so much the better. Then on Sunday, we have the Derby della Mole, played between Torino and Juventus. Sadly, this match is very near meaningless: if Juve win and Napoli lose, Juventus will clinch the scudetto. Torino, fresh out of Serie B, are simply happy to be almost safe from relegation. But if il granata manage to delay the victory parades through Turin, Torino will have to consider their season a success. This weekend’s derbies call for a different sort of direction than I had you take during #RivalryWeek, when you were encouraged to find beer from the opposing city and give it a taste. Intra-city derbies should be all about the strong ales, as a touch of tipsiness is essential when thinking up the clever one-liners necessary to sink the opposition. Belgian beers are often the best to choose when seeking this particular style. They might be a bit expensive, but since they taste great and you’ll drink less of them, it’s worth paying a little extra. Standard Belgians come in dubbels, tripels and quadrupels. The quads usually weigh in around 10%, but the best ones manage not to overpower the palate with heavy alcohol tastes. 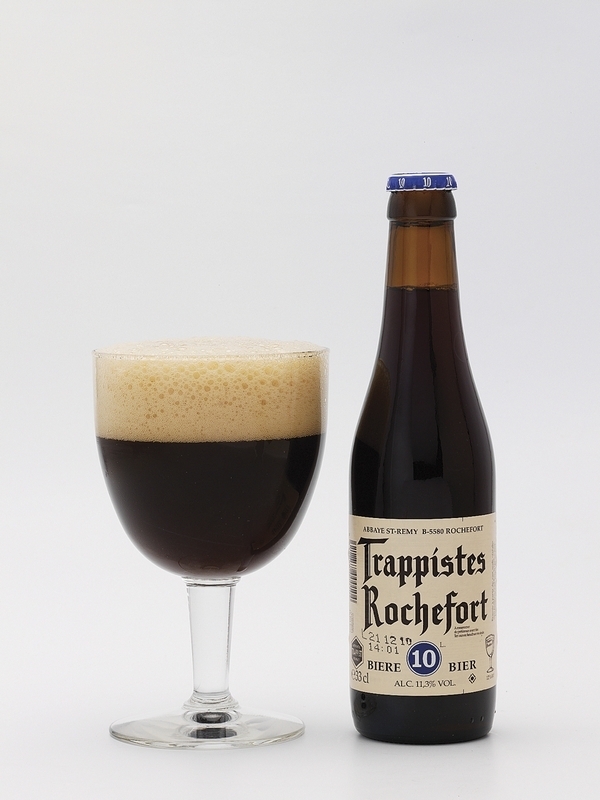 One of the bests is a Rochefort 10, a trappist beer that’s fairly easy to track down. The Rochefort has a fantastic aroma of dark fruits, mostly plum and raisin. The taste balances the fruits with chocolate and caramel malts, but with a slightly bitter finish, it manages not to be too sweet. If you’re looking to buy a six-pack you can share with your non-enemy neighbors, give New Belgium Brewing Co.'s Trippel (Fort Collins, CO) a try. Often New Belgium standards are a bit boring, but, as could be assumed from the name of the brewery, they’ve managed to create a solid tripel. There’s nothing flashy about this one, but it stays true to the style, with candy-sugar aromas and plenty of caramel malts in the taste. It’s spiced with coriander, which keeps the sweetness from being overpowering. Finally, if you love derbies as much as I do, be sure to check out two of the most heated, coming up in the next couple weeks. In Istanbul, expect to pay a high premium if you need to purchase a flare around May 11, when Fenerbahçe hosts Galatasaray. Just a few days later, on May 17, Belgrade batters down the hatches as Partizan and Red Star meet in a match that could very well determine which side will grab the title. Emerald City Supporters members, Seattle Sounders player Roger Levesque, and Sounders announcer Ross Fletcher taste test Redhook Brewing Company's No Equal" Amber Lager (made for the Emerald City Supporters SG)) and Widmer Brother's Brewing Company's "Green & Gold" Kolsch (made for the Timbers Army SG). Think they might have been a little biased? Now we've tried both "No Equal" and "Green & Gold" and while the Sounders are having fun and games with propping up te ECS beer and burning of the TA beer they're both very well-crafted brews. Beer Advocate and Rate Beer both give solid ratings for ECS' amber while the TA kolsch doesn't have enough ratings to aggregate a score yet on either BA or RB they early reviews are just as positive as their Cascadia competitor. We've always stressed at the Free Beer Movement that its completely fine to hate your opponent for those 90 minutes on the field just as long as you can share a brew before or after the match. Ryan Johnson of the Portland Timbers runs away with the 2013 Goal of the Week Award for week six. Toronto’s Darel Russell was expected to be the favorite during voting; however MLSSoccer.com reports that a late surge in voting swept the result for Johnson on the last day of the poll. The sequence began with Darlington Nagbe picking the ball off of a Houston Dynamo player in the orange half of the field. Nagbe plays a give-and-go with Rodney Wallace and then another with Kalif Alhassan to free up ample space in the center circle. With Dynamo defenders trying to adjust to the developing threat, Nagbe sends a perfectly weighted pass to the quickly advancing Ryan Johnson to beat the offside trap. Johnson moves in on goal and quite easily defeats the keeper and onrushing orange to net the ball. Cascade Brewing operates two brewpubs: the Cascade Brewing Barrel House east of the river near downtown and Art Larrance’s Raccoon Lodge & Brew Pub in Raleigh Hills, OR (southwest of the city center). If you aren’t local to the Pacific Northwest, you can also mail order brews through the website to be delivered by your friendly neighborhood UPS guy. In addition to the Timbers’ win, Cascade Brewing owner, Art Larrance, won the Brewers Association Recognition Award at the Craft Brewers Conference in Washington, DC, last month. Cheers to Portland beer, and cheers to soccer!